£10,000,000 divided by 30,000 is £333 per home. And I don't know how anyone can say the there has been mis-selling - the DDR has ALWAYS been part of the plan! See, from 17th June 2008 The great digital dividend sale | 4G mobile | ukfree.tv - 10 years of independent, free digital TV advice for example. "Which new services can be run in these channels? Ofcom will allow bids for the spectrum to be in blocks of 8MHz and 5MHz. This could mean that some allocations will no longer align to the traditional channel number boundaries. FDM mobile broadband using frequency division duplexing (like 3G mobile) "
Vodafone, O2 and EE have all received permission to convert some of their 2G allocations to 3G in the past, O2 certainly have done so in places. Base stations are certainly not 'low power'. The permitted maximum power for 2G base stations is 32 dBW or 1.58 kW, for 3G that goes up to 35 dBW or 3.16 kW (at least that's true of the base stations at the Caversham phone exchange, over the road from me and on the path from me to the Hannington TV transmitter - though my aerial points to Crystal Palace). That's greater than a very large number of the relay TV transmitters, though not close to most of the 'main' TV transmitters. The issue is going to be the *relative* power of the base station's signal, relative to the strength of the TV transmitter's signal, the background noise, and the interference from other TV transmitters that's already present. Different equipment is likely to be affected by different levels of interference. It makes figuring out who will be affected very difficult. 800 MHz transmissions may travel further, but that's true for both the wanted and unwanted signals. 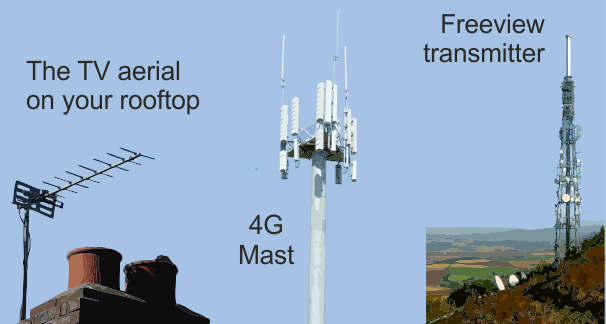 To get coverage at any decent level of capacity, they will need to use a dense mesh of base stations just as they do now. In rural areas, where it isn't interference-limited, there may be some advantage: however, that's the *least* likely place for 4G to be deployed. As ever, they will deploy the services in densely-populated town and city centres first, to maximise the number of people they can cover for the minimum outlay. Of the six blocks, only two will have any coverage requirements at all (these two will be auctioned together). The auction is six blocks of 2x5 MHz, not three blocks of 2x10 MHz, though as I said earlier blocks 5 and 6 are to be auctioned as one lot. I still find it deeply ironic that the guard band between downlink and uplink frequencies is 11 MHz, but the guard band between the new and previous users of the band is only 1 MHz. Thanks for the reply Brain Butterworth il just have to wait and see where they will put the new mast once they win the 4G bid. As long it's away from the Llanddona transmitter that's fine. I think the term we're looking for is desensing here. Whilst the signals are near to the wanted signals, they'll be within the pass band of any amplifier - indeed if there is any attempt to limit their bandwidth in any case. Just like some amplifiers are filtered against TETRA, those affected would have faced quite large costs to receive a relatively weak TV if they went down the filtering route, which would have been paid for by the 4G supplier. There's not much of guard band really and given that TV front ends go up to Ch 68, their receiver performance isn't in the communications receiver class. Seems they would simply shift those affected onto Freesat to avoid any excessive costs. and professor Sylvia Harvey, is quoted. To be honest I think it would be very wise to just wait and see, If any of you here are effected and then in the future if you do experience problems don't worry because for most of you we will be able to sort the problem out. If you over react you may end up having work done that was never required, Similar to all the people that rushed a head having new so called digital aerials erected when in most cases there old aerial systems would have worked just fine. So just wait and keep your money in your pocket. If there's going to be any problems the bulk of it is going to be due to inferior coaxial cables which allot of contractors have been using. Don't be mislead that if its twin screen its ok, you cannot go much further from the truth because allot of cables that have and are been used are copper clad, which means its steel or alloy that been very finely coated with a copper layer and the second shield is thin foil which the cable price is a fraction to that of the cable required which which consists of a solid copper core together with the copper braid and copper foil such as Triax TX100 LSF or eq,which is what I use so my own personal customers will be ok.
Ive just quickly worked out that I can buy 1,250 meters of copper clad cable up against a 250 meter drum of TX100, so you can see why allot of riggers have used the copper clad. I can see some unhappy customers if there getting substituted FreeSat in replacment of Terrestrial where they have been getting reception from a main transmitter because although theres a few different programs available theres programs like Yesterday which is a history channel thats not free via satellite, the only way you can receive it at the moment is subscribing to Sky. Hopefully that will change In the future. Most of my customers that we have supplied and installed Freesat to are people due to there location could only receive Terrestrial reception via a repeater transmitter where the program choice was and still is very limited. WINTER HILL transmitter. Is it possible to predict - at this present date - if my FREEVIEW signals will suffer interference from the proposed new 4G transmissions? 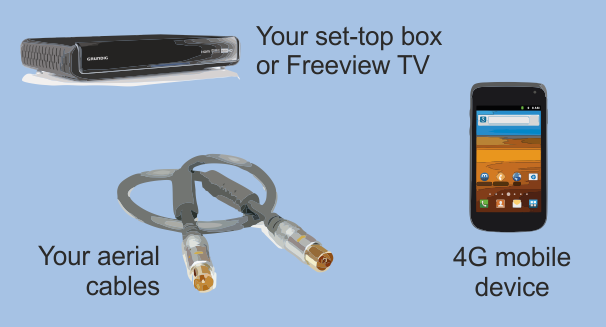 If I am forced to abandon Freeview will I have a choice between FREESAT or cable services. (It is my understanding that VirginMedia cable services ARE available in my area, and I would prefer cable to satellite reception.) In such a situation would the holder of the local relevant 4G licence be responsible for making the relevant payments DIRECT to VirginMedia, or would that responsibility fall upon myself? Howard Moore: No it isn't possible to predict. I wouldn't expect, in cases where an alternative is provided, that this would ever be a subscription service! In understand that in the first instance a single filter will be provided to an affected household.